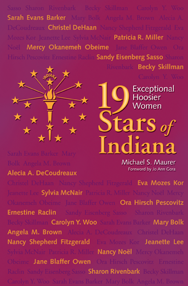 The 19 outstanding contemporary Hoosier women profiled by Michael S. Maurer — one for each star in the Indiana state flag — are leaders and pioneers who have excelled in a variety of pursuits, including law, business, philanthropy, government, medicine, music, art, athletics, religion, and education. Among the inspiring life stories are those of the first woman named chief judge of the U.S. District Court in Indiana, the first to establish a Holocaust museum in the state, and the first woman elected Indiana’s lieutenant governor. Maurer also introduces international golf and billiards champions, opera singers, a rabbi, the founders of Vera Bradley Designs and For Bare Feet, and others. Many of theses women led heart-pounding lives. All worked hard, and with zeal, to achieve their dreams. Women of every generation will enjoy and appreciate their stories.